Comoros security forces intensified their crackdown against anti-government rebels on the island of Anjouan on Thursday, with witnesses reporting heavy gunfire and residents fleeing on the fourth day of clashes. Moroni sent in reinforcements to quell the unrest that follows months of tension as President Azali Assoumani's bids to extend term limits through planned constitutional changes that could see him rule for 11 more years. Assoumani won a referendum in July allowing him to scrap the rotation of the presidency between Comoros' three main islands after one term, disadvantaging opposition-leaning Anjouan which was next in line. "The afternoon was calm, but it was the calm before the storm," said an official at Anjouan's airport. He confirmed the arrival of a significant contingent of security forces on the island in "two rotations" charged with suppressing the nascent uprising. The old medina quarter of Anjouan's capital Mutsamudu, with its narrow, intersecting alleyways, has become the epicentre of the fighting. Security forces were surrounding the rebel stronghold and many civilians have fled the area. "Those who were able to fled the old town to seek refuge in the outer suburbs... which are a safe haven," said one witness who declined to be named. French expatriate Anais Greusard told AFP that there were "big explosions" late on Wednesday and "a lot of shooting" in the early hours of Thursday. "The difficulties seem to be concentrated in the centre" of Mutsamudu, she said, also confirming that some residents had fled their homes. Another resident living close to Mutsamudu said gunfire had continued into the early hours of Thursday in the most intense flare-up since the clashes began. Witnesses described water and power cuts in the medina and some surrounding areas, but traffic was circulating normally elsewhere in the city. "We're without everything -- but mostly water. The lack of water is unsustainable. It's been four days since we had water," said a local woman living near the medina in Chitsangani district who was sheltering family members who had fled the old town. Residents began to stockpile bottled water and buckets with emergency supplies in response to the shortages. Interior Minister Mohamed Daoudou said on Wednesday that the situation was back to normal in Anjouan after three people were killed in the violence. Witnesses claimed that many more people had been injured in the clashes. He blamed "terrorists, as well as drug addicts and alcoholics" for the unrest. "The people are revolting... they won't stop shooting," said Ahmed Samir, an exiled leader of the opposition Union for the Development of the Comoros (UPDC) party who added that the people wanted to oust Assoumani. Samir claimed that around 40 armed men were leading the armed insurrection against government forces while witnesses described masked men with automatic weapons roaming the medina. A night-time curfew remained in place on the island. "We will be closing soon, the curfew starts at 8:00 pm (1700 GMT) until the morning," said one grocer. An AFP team in the normally bustling city of Mutsaumudu saw empty, dark streets and shuttered storefronts as residents opted to stay indoors. Assoumani, who came to power in a military coup and was elected in 2016, has indicated that he plans to stage polls next year which would allow him to reset his term limits and theoretically rule until 2029. 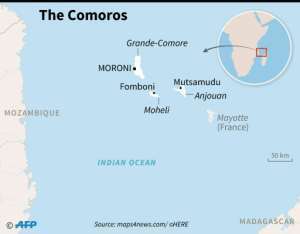 The poor, coup-prone Comoros islands -- Anjouan, Grande Comore and Moheli -- are located between Mozambique and Madagascar. The fourth island, Mayotte, remains French. Two people from Anjouan arrived on a Mayotte beach with gunshot wounds in the early hours of Thursday, police said, though authorities could not confirm if they were injured in the ongoing fighting. Assoumani's government accuses the Juwa party of former Anjouan leader and island native Abdallah Sambi of being behind the unrest. The crisis was sparked on Monday when unidentified gangs erected barricades on the island which were then cleared by heavily-armed troops. Sources close to the authorities said that representatives of the island's local government, controlled by Juwa, had met national government officials at an undisclosed location for talks. The United Nations and African Union had called for stalled talks between rival parties to resume.